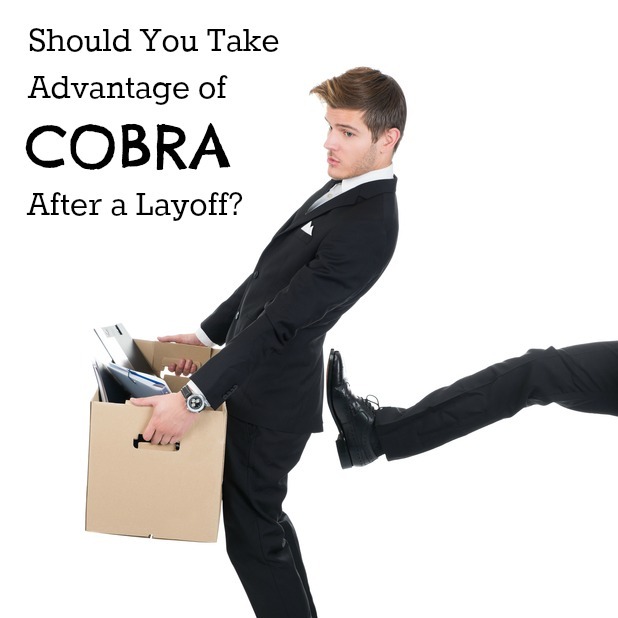 Home / Career / Should You Take Advantage of COBRA After a Layoff? Next to the loss of your income, the biggest concern you’ll probably have following a layoff is the prospect of losing your health insurance. This is a rational concern. Not only will you not have sufficient income to deal with medical events, but the very fact that you’re unemployed can make you more vulnerable to accidents, injuries, and certain types of illnesses. For these reasons, you’ll want to do whatever you can to make sure you have at least some type of health insurance in place during your time of unemployment. The most common form of health insurance following a layoff is through COBRA. This is an extension of health insurance coverage that large employers are required to make available to their employees following separation. COBRA is a federal law passed in 1985. It stands for Consolidated Omnibus Reconciliation Act of 1985. It is a law that requires employers to offer health insurance coverage to former employees under certain circumstances – that includes layoffs. Under COBRA, health insurance benefits under an employer’s group plan are made available to the employee and the employee’s family for a period of up to 18 months. However, if you are deemed to be disabled – by the Social Security Administration – the coverage can be extended up to 29 months. And in the event of divorce, or the death of the employee, coverage may continue for up to 36 months. There are solid reasons for accepting COBRA coverage in the event of a layoff. The continuation of your existing health insurance plan is one. It will provide you with complete continuity in regard to providers, at agreed-upon benefit levels even after your layoff. In effect, it will mean business as usual for you and your family, at least in regard to health insurance. Along the same line, if you opt to take the COBRA plan, there’ll be no break in your health insurance coverage. That can be especially important if an illness or injury occurs shortly after your regular employer-sponsored health insurance terminates. That will be the last thing you will need on a greatly reduced income. It will also avoid the necessity of shopping around for a new plan. And when you’re dealing with a layoff, you need to keep your time and your mind free to focus on the job search. Looking for the right health insurance plan can be a distraction that you don’t need right now. Unfortunately, COBRA is not necessarily the best deal you will get in regard to health insurance. Cost is probably the most prohibitive factor. While you’re an employee, it’s very likely that your employer paid a large amount of your monthly health insurance premium – they may have even paid most of it. But once you are separated, you’ll have to pay the entire monthly premium: your portion and the employer contribution. In addition, the administrator of the COBRA plan can mark the premium up with an administrative fee, typically adding something on the order of 15% to the monthly premium. This is the primary reason why people opt out of COBRA – they simply can’t afford it following a layoff. One of the basic limitations of COBRA is that it is a temporary health insurance plan. As stated above, the policy will only remain in force for up to 18 months in most cases. After that, you’ll either have to replace it with a new employer-sponsored plan or get a private policy. If your future involves working for an employer that does not provide health insurance, or if you decide to become self-employed, you will need to find a replacement policy for your COBRA plan within 18 months. That can delay your problem without solving it on a permanent basis. Since the passing of the Affordable Care Act (Obamacare), the options in regard to health insurance policies have slimmed considerably. Gone are the days when you could take a catastrophic health insurance plan, with high deductibles and low premiums, just to get you through a stretch of unemployment. You’ll have to fit into one of the Obamacare plans – Bronze, Silver, Gold or Platinum – with whatever premiums and limitations each has. However, there may be advantages to having this option. One of the biggest reasons why people were forced into COBRA in the past was the presence of pre-existing conditions. Obamacare has done away with pre-existing conditions, which means you are virtually guaranteed approval and can not be charged higher premiums. The only factors that a health insurance company can adjust your premiums on are geographic location, your age, and whether or not you are a smoker. With the elimination of pre-existing conditions, applying for a policy is also easier than it’s ever been. The application process can generally be completed on the phone, in not more than 10 or 15 minutes, and you’ll be asked no more than a half-dozen questions. Since COBRA is generally offered to the separated employee several weeks after a layoff, you should investigate your options under Obamacare as soon as possible. Once you know what your premiums will be under that plan, you’ll be in a position to judge whether or not COBRA is the right plan for you. What do you think about COBRA in light of recent changes to healthcare options? Leave a comment!